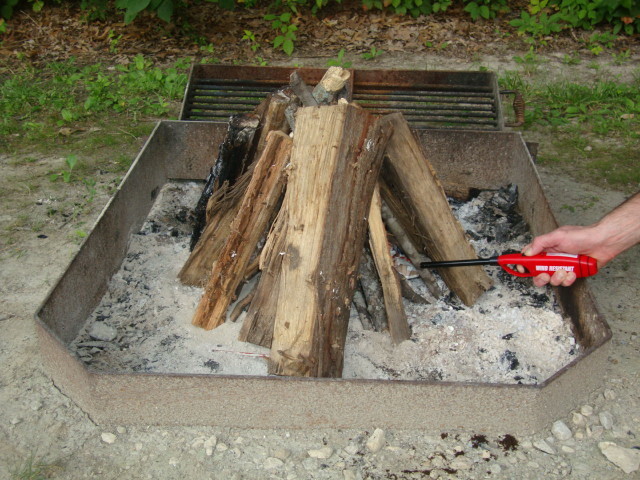 Building a campfire is easy...if you have the right tools and equipment. Then you can sit back and enjoy! 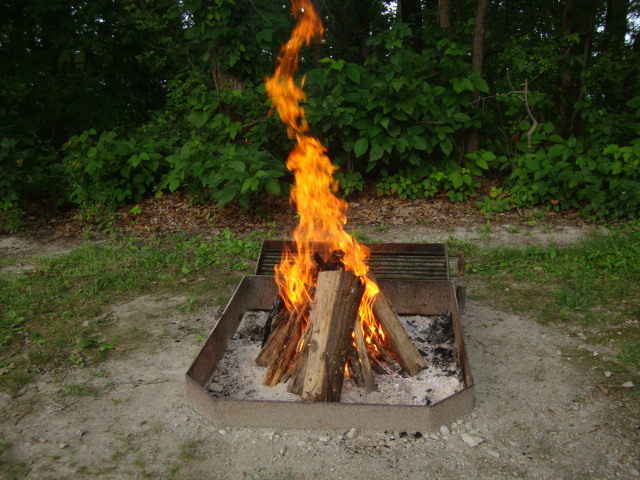 In almost every campground, the evening fire is a ritual that many people enjoy being part of. Often someone will pull out a guitar, or other instrument, and lead the group in singing. Others will sit there talking and laughing until quiet hour starts. No matter how you enjoy being around the fire, the one thing we all have in common is the memories that it creates throughout the years. 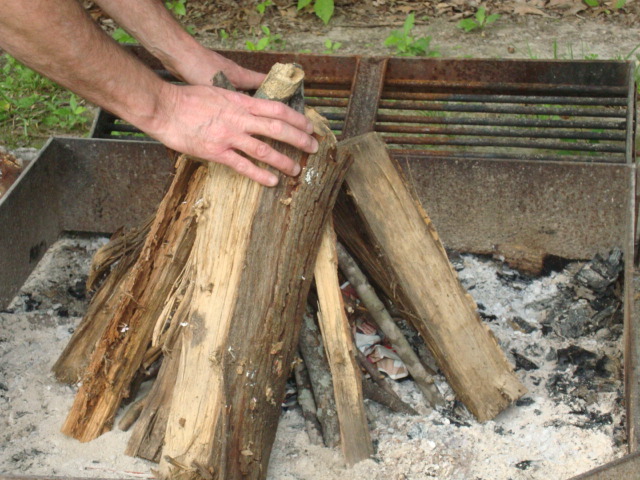 One of the basics you will want to learn, if you don't already know it, is how to safely build a fire. 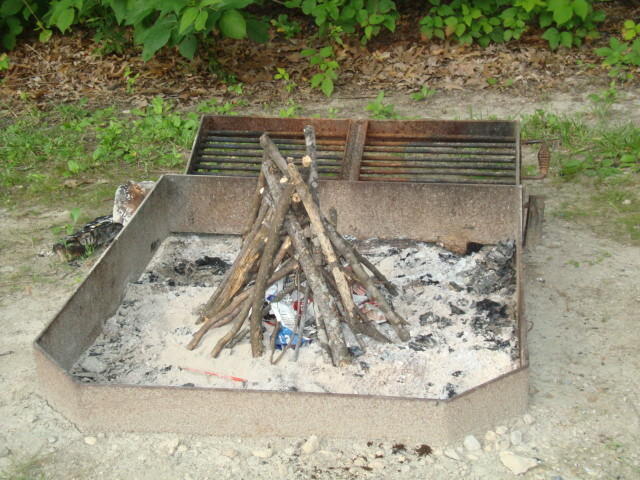 I have built many fires over the years and very seldom use any gas or starter fluid when building a campfire. 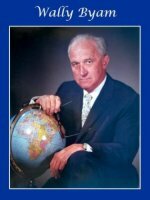 For any fire to be successful, you need to have three things present at one time. 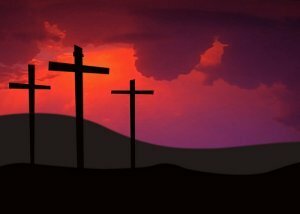 These are heat, fuel, and oxygen. If any are missing, or not in enough supply, your fire will not burn. With that being said, let's start building a campfire! Your choice and placement of the wood is going to greatly affect the success of your campfire. It is important to start small and work up, placing the wood in an open pattern. This will allow for the free passage of air which contains oxygen, the second part of the equation. 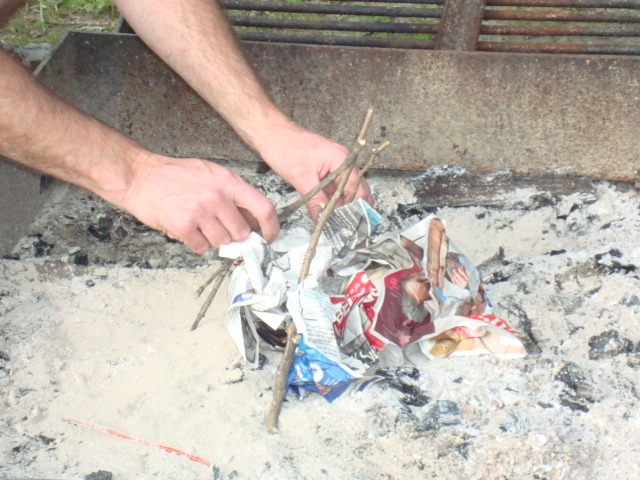 When I am building a campfire, I usually like to use paper as my base fuel. I find newspaper works the best and paper towels the worst. If you don't have paper available, dry pine needles or hemlock branches are also a good base too. Crumple the paper, or lay the pine needles, in a loose, but compact, pattern. The reason for this is that if it is too tight, air can't get through to grow the flame, but if it is too loose the flame can't spread. 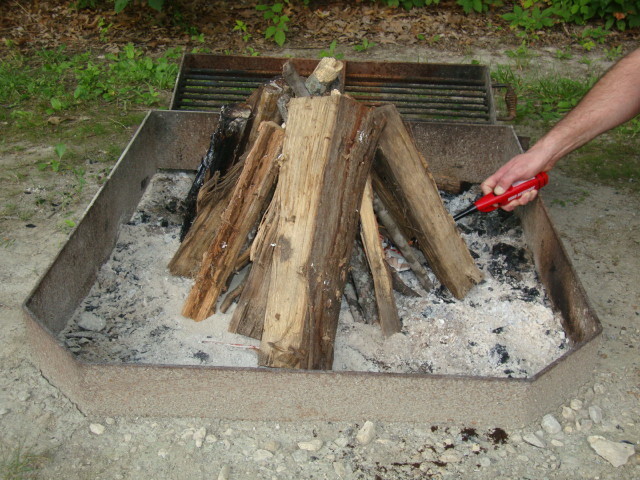 Take wood that is not too thick, usually twigs are the best, and set one end on the ground and place it pointing upward. Now, take another piece of about the same size and do the same, bringing their tops together. Continue to do this until you have surrounded your base with this wood. It should resemble a "tee-pee" that is slightly above the base, but not too far with plenty of spaces to get to the base. Now you will repeat the last step with the next size up. 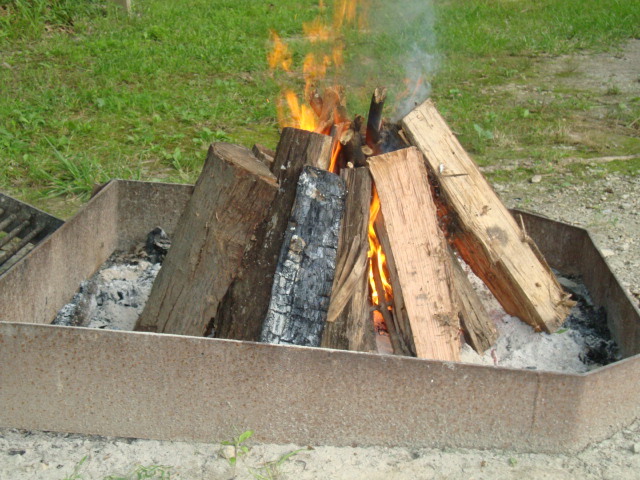 When I am building a campfire, I like to go three or four layers before lighting my fire. I will usually put two larger logs on the very outside, but keep the largest for after the fire has been burning for a while. Now it is time to light the fire. Using either matches, or a long "Scripto" lighter, you will light your base on fire. This is the heat, part three of the equation. If you have built your "tee-pee" right, there is plenty of gaps so you and the air can reach the base. If this is the case, you will be enjoying your campfire in a matter of minutes. 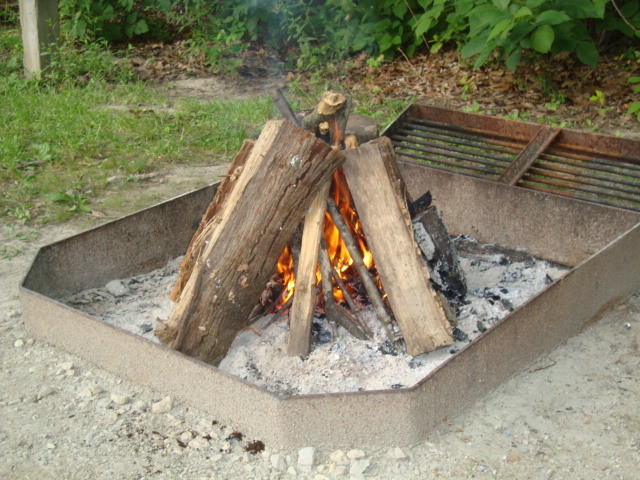 Allow enough room for air to enter as you safely light the fire. Get the hot dogs ready! Building a campfire and watching it is a lot of fun, but you must always be mindful of the dangers that go along with it. Every year many campers are rushed to the emergency room because of burns and other injuries they received at the fireside. Safety should always be one of your first concerns no matter what, but especially when you're near a fire. A little common sense can be the difference between a very enjoyable weekend and a disaster. Here a some tips that will help you enjoy your experience without any incidents. One person should tend the fire at a time. Children should not be allowed to feed the fire. Older children who are learning should be assisted by a responsible adult. Do not allow anyone to run near a fire. 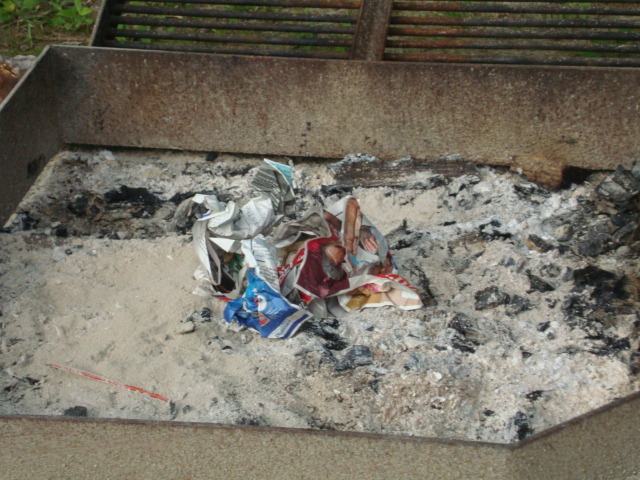 Fires should not be left unattended. Put out your fire before you go to bed. We like to use a bucket of water. 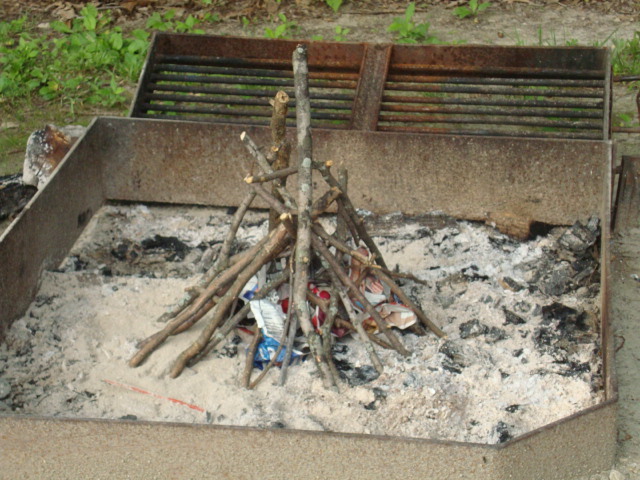 I stated earlier that I seldom use gas or lighter fluid when I am building a fire. 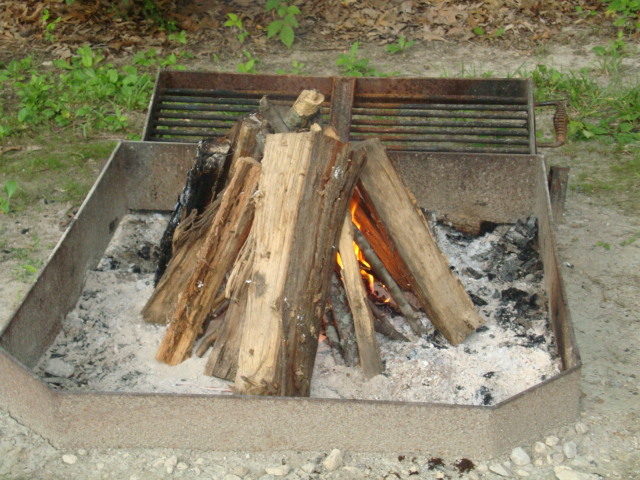 Besides having been taught proper fire building techniques at a young age, I witnessed a negative effect of doing that. A man was lighting a fire on a damp evening and he used lantern gas to help get it started. When he lit the match, a line of fire shot down the hill. This was because the air was so heavy that the fumes from the gas stayed low and traveled along the ground. Consequently, the flame ignited the fumes and followed them to the bottom. The good news of this story is that no one was hurt and there was no damage done. Campfires are not just for your enjoyment, but for making memories with others too. So next time you hit the campsite, remember to make those memories with your family and friends, especially on those cooler evenings. 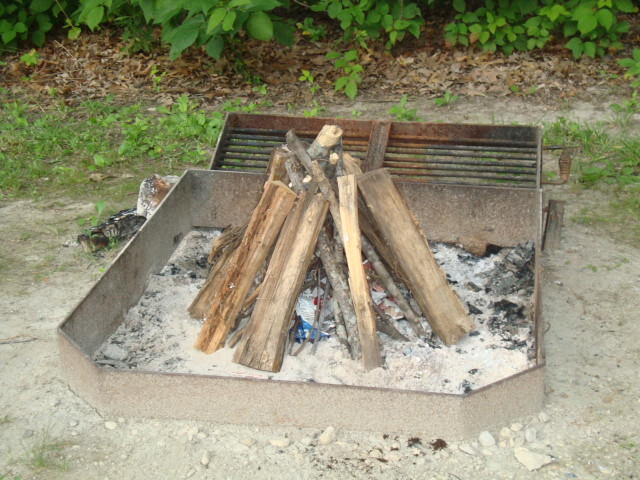 I hope this page has given you the tools you need for success the next time you are building a campfire. Hope you enjoyed the campfire!